Crafting Stations are usually player-made objects that will enable crafting or cooking of specific items. Items crafted by hand do not require a specialized crafting station. These items are usually simple but necessary for survival. The Inventor's Table is one of the first crafting stations players will craft, it's required to make most other stations. It can be upgraded twice. Inventor's Table is a basic crafting station for crafting other early game crafting station. Engineer's Table is the second inventor's station for crafting other crafting stations. Architect's Table is the highest upgraded inventor's station for crafting other crafting stations. The base furnace players can craft at the Inventor's Table is the Primitive Furnace, it can be upgraded twice. The primitive furnace is a crafting station for smelting basic ore into bars. Industrial furnace is the second tier furnace used to smelt ore into bars. It's required for crafting Titanium Bars. Atomic Furnace is the highest tier furnace used to smelt advanced ore into their refined versions. It's used to refine end-game/top tier ores. Basic farming, hunting and survival gear can be crafted at a Foraging Table. It can be upgraded into an Agricultural Station. The foraging table allows players to craft the basic tools for farming (hoe, watering can) in addition to hunting weapons (for farming monster meat and drops) and survival gear like mining lights. 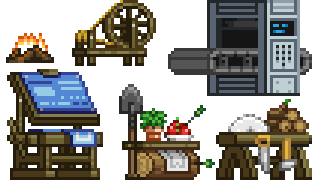 The agricultural station upgrade expands crafting recipes. for farming, hunting and survival. Anvils are used primarily for the crafting of weapons and armor, in addition to a number of other useful supplies. Anvils are crafting stations used for early ore based crafting of weapons and armor from iron and tungsten. Replicator is the third level anvil, it enables players to craft weapons and armor from durasteel. The replicator can be further upgraded by slotting either an Accelerator Addon, Manipulator Addon or Separator Addon on top of it. Using the Matter Manipulator to remove an upgraded Replicator drops both the Replicator and the addon separately. This allows a player to switch between addons without losing the addon or requiring multiple Replicators. Accelerator's Table is an the used for crafting the highest level ranged combat based weapons and armor, which balance energy and defense. It's enabled by slotting an Accelerator Addon on a Replicator. Manipulator's Table is an the used for crafting the highest level staff combat based weapons and armor, which has low defense to allow very high energy. It's enabled by slotting an Manipulator Addon on a Replicator. Separator's Table is an the used for crafting the highest level melee combat based weapons and armor, which has low energy to allow very high defense. It's enabled by slotting an Separator Addon on a Replicator. The Wooden Workbench allows players to craft to a number of furniture recipes, including chairs, doors, beds, and storage. It also has a number of craftable blocks recipes. Wooden Workbench is the initial furniture crafting table. Most furniture blueprints players find in biome chests will be available to craft using this station. Industrial Workbench is the highest upgraded furniture crafting table. Upgrading will unlock new furniture and block recipes for crafting. The medical crafting stations offer players some non-food consumables, bandages and stim packs. Apothecary is the initial medical table. It allows players to craft basic healing and status effect booting consumables. Apothecary is the upgraded medical table. It allows players access to more advanced healing and status effect booting consumables. Campfires is crafting station that is used for cooking basic foods. Most foods at the campfire only require one ingredient. It also provides light in the area around where it's placed. Kitchen Counter is the base level cooking station for manufacturing most cooking recipes. It is the second cooking station most players will make, after campfire. The spinning wheel lets players craft a number of clothing pieces, which don't offer protection but look nice. There's also a number of materials which can be refined here to be used in more advanced armor crafting at an anvil. The sewing machine is the upgraded version of the spinning wheel. It allows access to advanced crafting materials and dyes. A Toymaker's Table allows for the crafting of several Christmas vanity items by using Holiday Spirit. The table is currently inaccessible and Holiday Spirits do not currently drop from monsters. A Heart Forge allows for the crafting of several Valentine's Day vanity items using basic materials. This station is also currently disabled. A Refinery is used to convert ore into pixels. A pixel compressor is used to compress pixels into tradable, storable, stackable items called voxels and decompress them back into pixels at the same value. The pixel printer is a station which can replicate scanned objects. Once scanned objects will appear in the printer list, and can be printed using pixels. The fossil station is used to craft brushes and display cases for fossils. The Wiring Station is used to create various items related to wiring, allowing for the building of mechanisms and connectivity between objects. A Rail Crafting Table is used to craft objects and items related to rideable rails, and enable a form of quick transportation within a planet. The Pet Station is used to craft capture pods, which are used to tame weakened monsters. It can also be used to craft a healing station and tether for captured pets. This page was last modified on 16 October 2017, at 01:16.